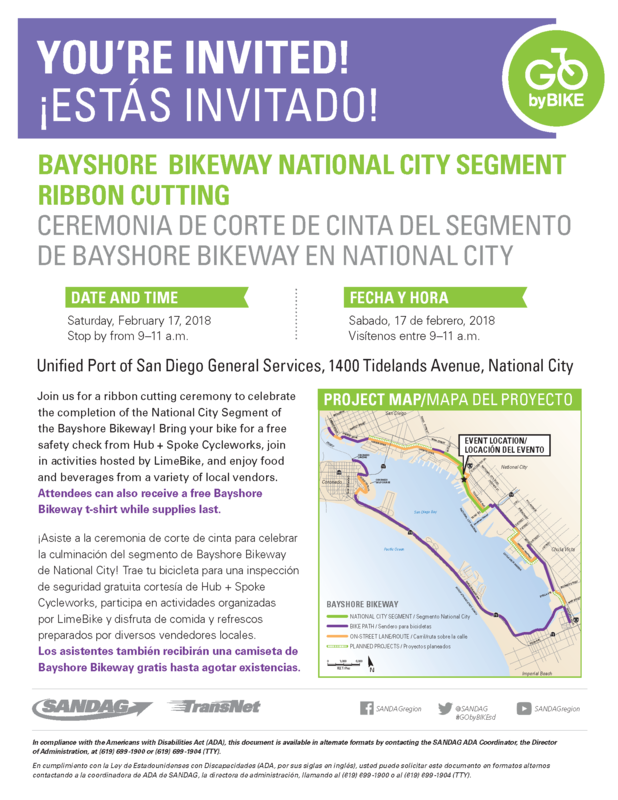 This Saturday, 2/17, BikeSD will be joining SANDAG, elected leaders, and the public to celebrate the opening of an improved section of the Bayshore Bikeway in National City. It’s great to see another portion of the Bayshore Bikeway get upgraded and we look forward to the completion of the full Bikeway, which was started in the 1970s. BikeSD will be present and sharing a table with our friends from the San Diego County Bicycle Coalition. We’ll have our wonderful water bottles and terrific t-shirts for sale as well as flyers and stickers to give away and information for the public to get involved with BikeSD. The ribbon cutting event starts at 9 AM at 1400 Tidelands Avenue, National City, CA 91950. The actual act of cutting will be at 9:30 AM with remarks and cheering. Come and enjoy the festivities with food and great local businesses like Hub + Spoke Cycleworks. After the ribbon cutting we’ll be going on a group ride along the Bayshore Bikeway to Coronado with a stop at Trident Coffee in the recently opened Bikeway Village in Imperial Beach. We’ll return on the Coronado Ferry which heads from Coronado to Downtown San Diego every half hour so we’ll likely be on the 12:30 or 1:30 ferry. We’ll start the group ride at 10:30 AM so please be there by 10:30 so we can all leave together. Join us for conversation, enjoying the beautiful Pacific Ocean and San Diego Bay, and celebrating a step forward in creating a robust bike network across the City of San Diego and across the region. Below is a map of the route we’ll take and after returning to Downtown San Diego we’ll disperse or grab lunch, as people prefer. It will be a great start to the weekend and the ride is very flat and almost entirely on a dedicated bicycle path. Please join us and spread the word. Here’s the official flyer for the event as well.